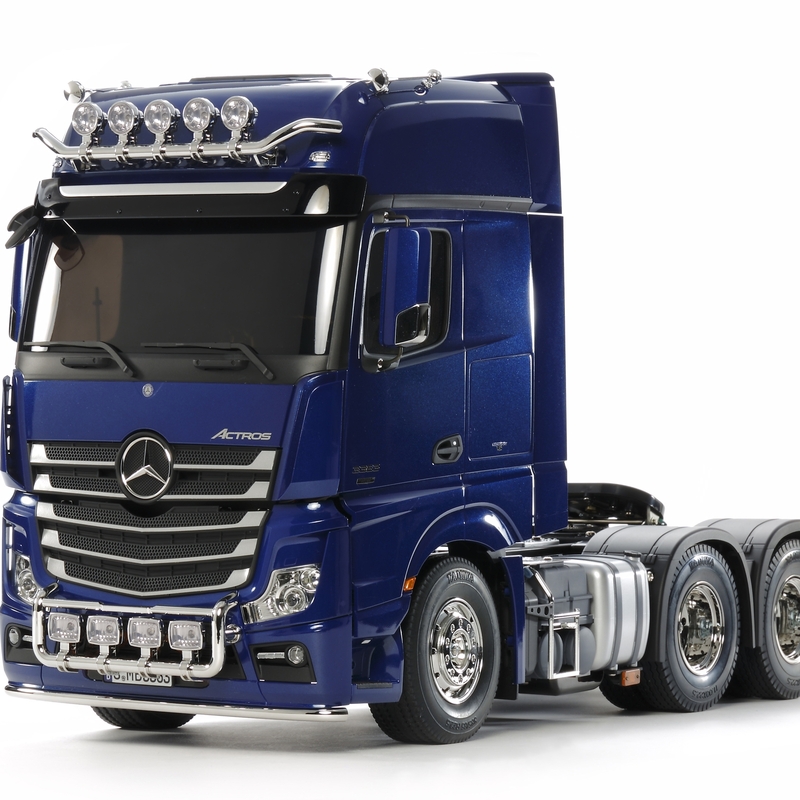 This is a special edition of the Mercedes-Benz Actros 3363. It features pre-painted Body parts in Pearl Blue (Tamiya Color TS-89) for a cool look, with a durable coating applied to protect the paintwork from damage. •	1/14 scale R/C model assembly kit. Length: 538mm, Width: 195mm, height: 305mm. 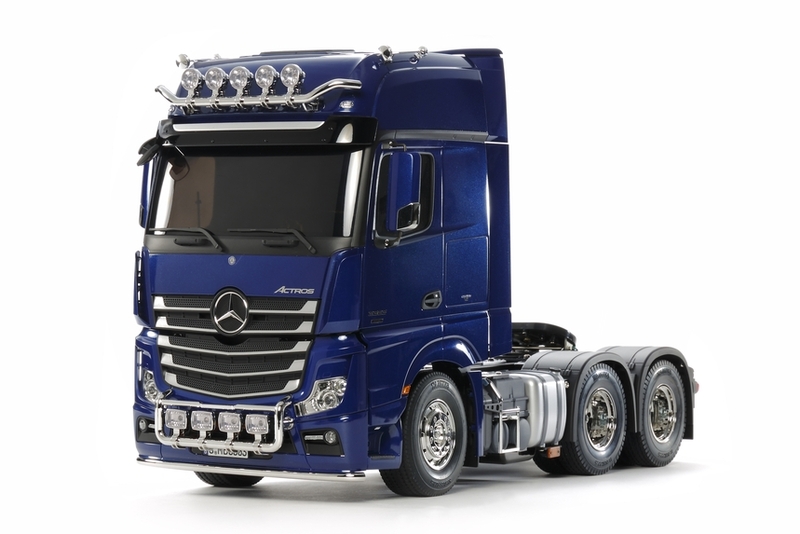 •	The 3-axle Actros body is expertly recreated, including roof and bumper auxiliary lights. •	Body, F, K, M and H parts are replaced with pre-painted Pearl Blue parts. They have been given a urethane top coat for a superb finish. •	The tried and tested Tamiya 3-axle chassis utilizes a tough ladder frame with aluminum side channels and resin cross members. A realistic drivetrain setup sees the front mounted motor powering twin rear axles. •	3-speed transmission can be controlled via 4ch R/C transmitter. •	Metal leaf spring dampers with built-in coil springs provide durable suspension. •	Coupler is included to enable connection with any currently available Tamiya 1/14 scale trailer. •	Compatible with separately-sold Multi-Function Control Unit MFC-03 (Item 56523) (or MFC-01, Item 56511) for realistic LED lights and sounds. 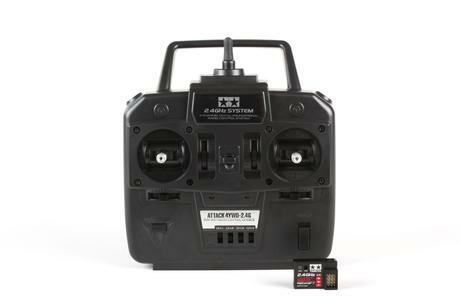 •	Requires: 4-channel radio, 1 servo, ESC, 7.2volt battery with charger.